Viavi’s comprehensive Surround the Antenna solutions are designed to streamline workflows and simplify operations with centralized inventory and test equipment management, and consistent presentation of results. Capitalize on market demand and manage operational costs with Viavi tools that help you turn up towers quickly, safely, and efficiently. Viavi has been working closely with mobile service providers to create comprehensive test solutions for installing and maintaining Heterogenous Networks (HetNets). Dirty connectors are the number one cause of poor performance in optical networks. Microscopic particles of dirt can create enough signal loss and back reflection, causing significant downtime and network damage. The increasing bandwidth requirements in today’s mobile networks leave little room for the errors caused by dirt. Easily overcome these problems with the right tools and best practices. 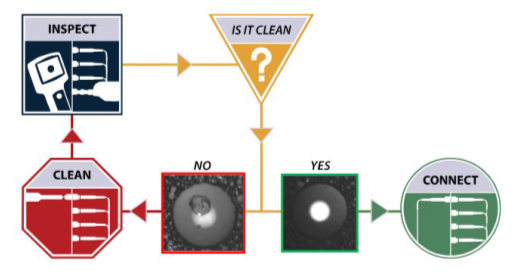 Using a fiber-inspection microscope to certify connector end-face quality, in accordance with IEC standards or the operator’s specification, is the cornerstone of proper fiber deployment. Ensuring fiber connector end-face quality guarantees the link will perform at the highest level possible. 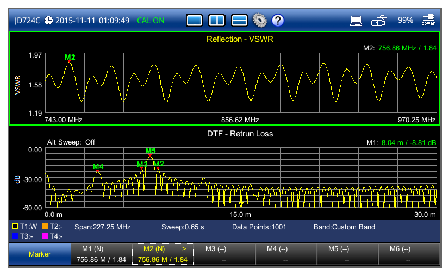 One of the most valuable and lowest-cost tools for FTTA is the visual fault locator (VFL). VFL uses brightly visible light to: 1. Check patch cords for microbends, macrobends, breaks, or bad terminations. Certify that fiber cable installation meets system optical budget requirements. 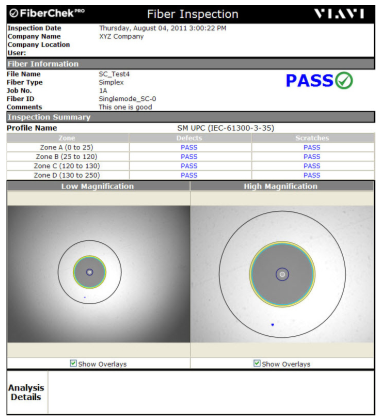 A minimum basic Tier 1 test is to perform a link or channel insertion loss measurement using an optical light source (OLS) and optical power meter (OLP or MP) to verify receipt of the correct range of power (not too little, not too much), ensuring that equipment functions at peak performance with maximum optical budget headroom. With installations in elevated locations, it is hard to judge installation quality or any impairment on the cable itself. Tier 2 certification involves OTDRs, which are the only devices that can characterize and measure fiber loss, locate events and impairments, measure the impact (loss) of each, and provide the distance to each one. Return loss is the loss of power in the signal returned/reflected by a discontinuity in a transmission line. This discontinuity can be a mismatch with the terminating load or with a device inserted in the line, and is a measure of how well devices or lines are matched. If the impedance match is good, all the energy will be transmitted through and nothing should be reflected. 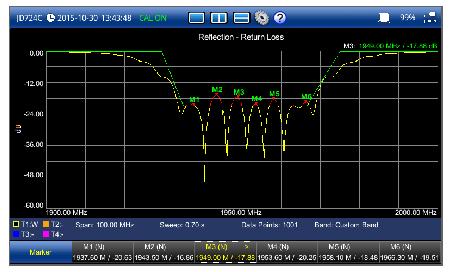 Just like return loss, the VSWR test also indicates how well the cable and antenna system is matched. VSWR stands for Voltage Standing Wave Ratio, and is also referred to as Standing Wave Ratio (SWR) and is a measure of how efficiently RF power is transmitted from the power source, through the transmission line, and into the load. 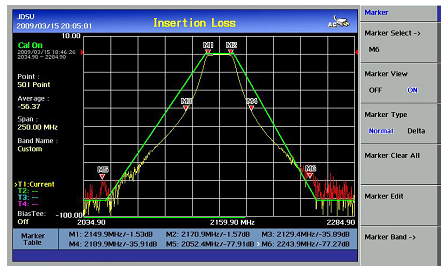 Insertion loss is the loss of signal power resulting from the insertion of a device in a transmission line and is usually expressed in decibels (dB). CPRI protocol enables the RRH and BBU to interact with each other over distances of several miles. When installing RRHs on towers and rooftops, it is extremely important to test the RRH links before connecting them to the BBU for service activation. Incorrect small form-factor pluggable (SFPs) and misconfiguration/faulty RRHs will disrupt the service, and necessitate the costly return of tower crews and delay the service introduction. 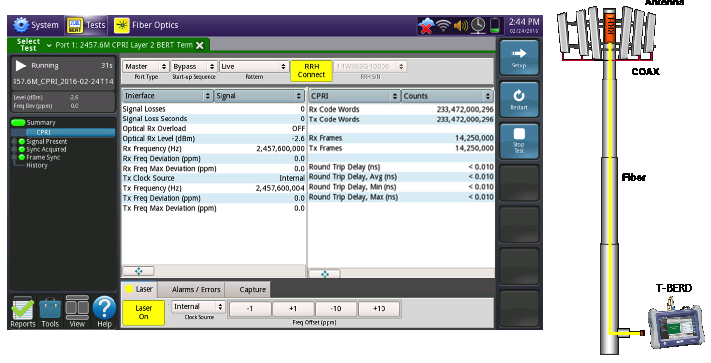 The CPRI test checks the power level and signal frequency, initiates a CPRI connection with the RRH, verifies frame synchronization, and measures the roundtrip delay to the RRH. All of these tests can be done from a single location without the need to dispatch a person to the remote site and perform a loopback at the RRH. These tests validate end-to-end configuration at either the Ethernet or IP level (depending on the backhaul network specifics) to ensure that key performance objectives such as Committed Information Rate (CIR) , Committed Burst Size (CBS), latency, packet jitter, and frame loss are met. Techs can select either RFC 2544 or Y.1564 to test a single service or select Y.1564 to test multiple classes of service. An RFC 6349 test checks end-to-end throughput using TCP traffic to ensure that the network provides the expected throughput without causing retransmissions that place additional strain on the limited wireless spectrum and cause poor end-user qQoE. 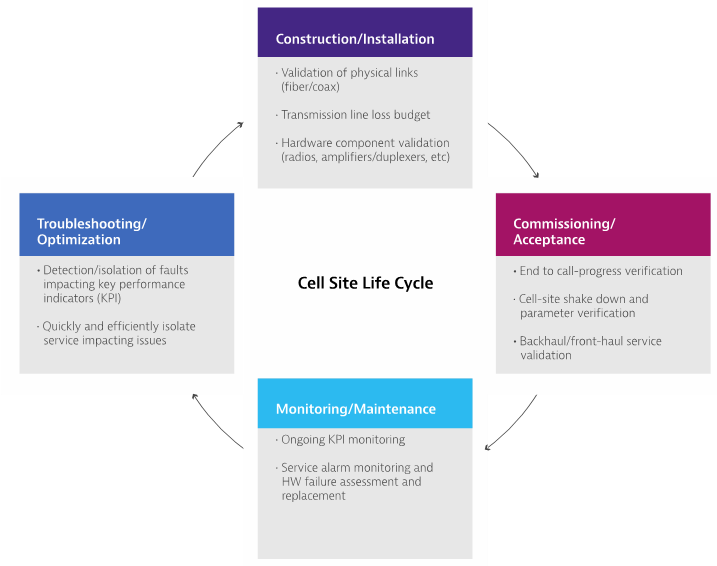 Operation of mobile networks requires proper delivery of frequency and time/phase synchronization to the cell site. 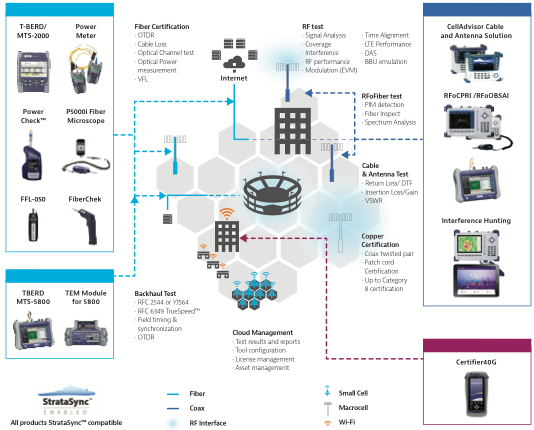 GPS and packet-based synchronization technologies such as PTP/IEEE 1588v2 and Synchronous Ethernet represent the synchronization delivery mechanisms. Incorrect synchronization delivery leads to severe operations issues, including interference and call-handover problems. New methodologies provide simple synchronization tests on the same instruments used for backhaul and fronthaul test. GPS test applications verify the correct position of antennas by checking the number of visible satellites and respective signal strengths. PTP/IEEE 1588v2 test ensures reliable connection of cell sites to Grandmasters and qualifies the backhaul network for proper delivery of synchronization by checking delay, delay variation, time error, wander and frequency offset of PTP, Synchronous Ethernet and 1pps/10MHz/BITS/SETS clock signals.